Nyos protein skimmers, additives, and test kits are distributed through EcoTech Marine in the United States. Today, EcoTech Marine announced they are adding foods to the Nyos lineup. 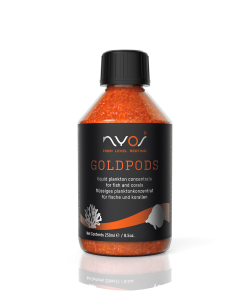 GOLDPODS are freshly-caught copepods which are processed using a patent-pending method that preserves the ultra-high nutritional fatty acids and proteins found in Calananus finmarchicus. The copepods are coated with an ultra-thin natural membrane that ensures maximum nutritional value for your fish and/or corals. GOLDPODS are available in 8.5 oz (250 ml) bottles. Refrigeration is not required for this product. 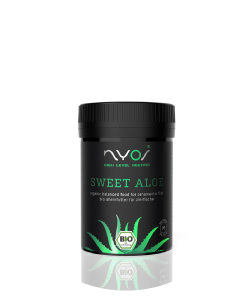 Aloe has been used in some refrigerated fish foods for years and now NYOS has a product called SWEET ALOE that can be added as a supplement for fish. SWEET ALOE contains organic aloe vera with added omega -3-, -6-, and -9- fatty acids. The food comes in granule form. 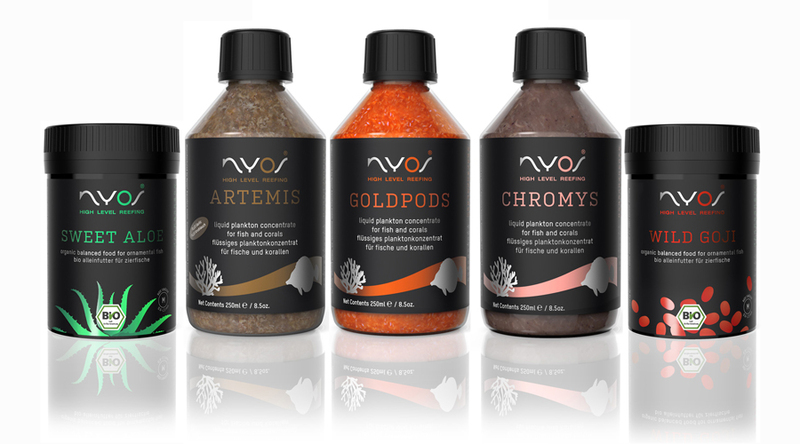 Granules range in size from .9-1.5 mm which is suitable for most fish. NYOS ARTEMIS is a liquid zoological plankton concentrate for marine fish and Large Polyp Stony (LPS) corals. The 8.5 oz bottle contains Artemia salina (.2-20 mm). A carefully selected blend of organically farmed high-quality algae (wakame, chlorella, spirulina) makes NYOS TRUE ALGAE a truly unique food. This food was created as a treat for algae-eating fish. The soft .9-1.5mm granules are easy for fish to ingest. The food iscompletely organic, pesticide, and GMO-free. A liquid zoological plankton concentrate for direct and immediate feeding. CHROMYS is high-quality Mysis relicta (0.2-20mm) which provide the perfect nutritional content for numerous marine fish and LPS corals. CHROMYS strengthens seawater fish vitality and accelerates coral growth. Goji is often referred to as a superfood for human consumption. WILD GOJI for fish is made from bright red organic goji berries. WILD GOJI s a soft, organic, color-enhancing food rich in vitamins, carotenes, and xanthines which will help make your fish healthy and rich in color. 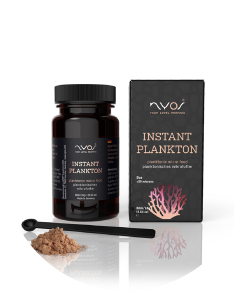 NYOS INSTANT PLANKTON is a highly developed micro-feed which NYOS claims is the perfect food for corals, invertebrates and marine ornamental fish. The food is neutrally buoyant so it will stay suspended in the water column for better consumption. Nyos LPS POWER is a 100% certified organic soft granulate especially formulated for LPS corals. Specially adapted for LPS corals such as Acanthastrea and Scolymi to provide corals with additional strength, improved colors and accelerated growth. Later today I will be reaching out to the guys at EcoTech Marine to see if we can give these new products a try on one of our farm tanks. 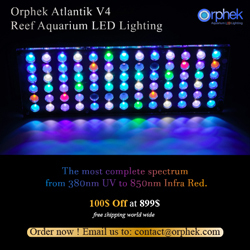 Click the links to learn more about EcoTech Marine and Nyos aquarium products.